Recently I have spent a lot of time talking about story writing, but this week the focus has been on Acceptance Criteria and there have been a variety of comments that have caused me to reflect and have caused me some concern. Unless stated otherwise a story is assumed to be happy path only. If it isn’t in the Acceptance Criteria we don’t have to do it. Acceptance Criteria must contain all details including all edge cases that must be tested, anything not stated doesn’t have to be implemented. If all acceptance criteria are met the PO/Customer MUST accept the story even if they are not satisfied. If acceptance criteria change before the story is done, it should be completed as specified and a new story should be created for the changes. after all, late changes to Acceptance Criteria demoralize Developers. If Acceptance Criteria are unclear we can choose what to do. The Acceptance Criteria should never tell us how to do the job. To respond to these questions I thought I would use a metaphor – A homeowner wanting to redecorate her house. The home owner hires a firm of decorators because they have a reputation for quality. Her first request is that the painter decorate the sitting room, She would like the walls painted blue, the ceiling an off-white, the windows also off-white but the paint needs to be wipe-able to avoid finger prints, and the doors and trim should match the window color. The acceptance criteria are details provided by the Product owner that would help the workman understand how to complete the job to the satisfaction of the Product Owner – in this case the home owner. The job can and probably should be broken down into smaller tasks (stories). Having just the windows painted has value, just the ceiling does too, just the trim and potentially each wall independently may have value although that may be harder to qualify with the Product Owner, depending on their needs. What you will note though is that the acceptance criteria did not state that the areas to be painted must be professionally prepared and sanded, that a primer coat be applied and two top coats are applied. They do not state that the carpets should be protected and that spills should be cleaned up and that there should be no paint on the glass and no wall paint on the ceiling, no ceiling paint on the walls or that the paint should fully cover the walls and be an even drip free finish. In fact the Acceptance criteria make no mention of how the work should be completed at all. Who is the audience of your Acceptance Criteria? The Acceptance Criteria come from a conversation with the Product Owner, but you may also want to take technical notes from conversations with those that will do the work. E.g. if the contractor has an apprentice, it may be necessary to spell out to him/her the technical details mentioned above, what seems common sense to you and the Product Owner may not be as obvious to someone less experienced. But notes on implementation are not acceptance criteria in the same sense. The product Owner should not be expected to understand all the technical details, what is acceptable is always determined by the Product Owner. But that means I only need to worry about the happy path right? So I need to do a good job with the specified work but I don’t need to care about drips or mess or if I am painting the walls I don’t need to care about the ceiling after all I am only doing the happy path. I can ignore walls that are hidden behind furniture, I can do the job quicker if I don’t put down dust sheets and we can worry about cleaning up the mess later right? Put like that it sounds silly doesn’t it, but that is what you are suggesting if you don’t consider anything other than the happy path, the minimal amount is done but you are leaving a mess to clean up later. If this is clearly understood and acceptable to the customer or that you have split a story like this to get feedback sooner there may be an exception but if you think that you can declare a story ‘done’ with a mess left to clear up later it is a recipe for a disappointed customer or a misleading impression that you have achieved more than you really have. Giving a sense of artificial progress may lead to disappointment later. If all acceptance criteria are met the PO/homeowner MUST accept the story even if the homeowner is not satisfied. There is some crown moulding between the walls and the ceiling, it was not mentioned in the Acceptance Criteria and the decorator has painted it the wall colour, but the Home owner wanted it the same as the ceiling and thought it was obvious so had not mentioned it. The decorator insists the job is done because the Acceptance Criteria are met. It might be that the customer is willing to accept the work as it stands and agree to the repainting later. But more likely they will want it fixed before you move on to the next piece of work. What is not acceptable is to refuse to make the changes because they were not explicit in the Acceptance Criteria. The story card is an invitation to a conversation, the Acceptance Criteria are reminders of what has been discussed. At no point do Acceptance Criteria or the card become a sealed contract. The painter is half way through painting the window and the Customer comes to check on progress. She sees the paint colour of the windows and decides it is too white, too stark and clinical and would like the colour changed to an off-white. She understands that the rework will cost and the new materials will cost and she accepts this, but she is unhappy with the colour. If you are unwilling to accept and adapt to changes in A/C even late into development, then you really need to go back to basics and ask if you genuinely support Agile software development. I am sorry if that sounds harsh but the notion that keeping devs happy and metrics pretty is more important than delivering the right thing for your customer is very frustrating for me to hear. The homeowner has been pretty vague in her choice of colours, blue and off-white. So presumably we can choose whatever we want? Clearly that is unrealistic. What might be more reasonable would be to talk to the homeowner and say “We prefer this brand and type of paint and these are the available colours within that range can you pick one” The homeowner may say, No I want a very specific Blue only available in this brand that needs to be imported from New Zealand. In which case you should explain that such a choice will increase the cost and duration of the job and adds to the risk – being an unfamiliar material, it may need more coats etc. If the homeowner understands and accepts those risks then it should be done, but if the homeowner can be presented with a less costly and less risky alternative then they may be willing to modify their request. Ambiguity should trigger conversation it should not be an excuse for making assumptions. Ambiguity should trigger conversation it should not be an excuse for making assumptions. The goal is a finish that the homeowner is happy with, the specifics are likely open to negotiation. But whilst you may present alternatives it is for the homeowner to make the decision. There are two types of things not stated in the Acceptance Criteria that apply here, how we do the job and some of the specifics. How: The Acceptance Criteria doesn’t explicitly say that we need a primer coat, but we know that for a quality job it needs to be done. The Acceptance Criteria doesn’t tell us which brushes to use, or how to paint to get a good neat coverage. The contractor may need to specify those to an apprentice, but the homeowner should not need to specify the tools to be used or how to do the job (unless that forms a particular part of the need) You as the contractor may need to spell out those details to your apprentice, consider those sub-tasks of the story. Prepare and protect work area; Sand surface, apply primer, apply first coat, apply 2nd coat, clean up area, clean brushes etc. But these are NOT Acceptance Criteria to be supplied by the home owner. They are about how to do the job not about the job that needs to be done. Sometimes these do overlap but generally we try to keep the how out of the request. There are also some specifics that may not be mentioned, for example there is a recess around the fireplace but only 4 walls were mentioned. Can I ignore the other surfaces? Likely not, details may have been assumed, if there is doubt clarify with the homeowner. There is something fixed to the wall which is too close to be painted behind, but if not painted it would look odd. The Acceptance Criteria shouldn’t need to specify that you need to remove it and paint behind to do a good job. But again if there is any doubt clarify it with the homeowner. The Acceptance Criteria will rarely be comprehensive and conversation will be necessary. Normally we try not to specify how the job must be done, but there will be exceptions to this. The homeowner may have a need to decorate using traditional materials, and so may specify that particular tools are used – e.g. No power tools, no lead based paint. No synthetic materials in paint or tools. Sometimes those requirements are not necessarily clear to you. The Customer may insist on 2 primer coats and 3 top coats. Two more coats than you feel is necessary for a quality finish, but they insist are how the job should be done. In those instances you may make recommendations or suggestions, and try to understand why they feel this is a requirement. But ultimately it is for them to decide – so long as they understand the additional cost and risk. But again there are exceptions to this, for example the customer my request that you skip a primer coat and only apply a single top coat, or insists that you use low quality materials to save on cost. If you believe that this will result in a substandard job, then again you should explain your reasons and try to find an alternative and if necessary refuse to accept the job if you feel that the result would reflect badly on you. Ideally it should be clear from the start what the expectations around quality of service are, but it may be necessary to re-clarify periodically if there is doubt. In story terms, the story should express the need, what your goal is. It is the start of the conversation(not the end) for assessing how to satisfy that need. The Acceptance criteria are simply notes to help remember that conversation, they do not form a contract. Acceptance Criteria should never be considered absolute, immutable or comprehensive. Uncertainty should be clarified with the Product Owner early and often. You should respond to changes in Acceptance Criteria quickly, the quicker you respond the less waste there will be. Acceptance Criteria do not normally express how to do the job, although you may note how you intend to do the job to illustrate to the PO to help clarify any ambiguities. You can’t have a discussion on Acceptance Criteria without mentioning Gherkin, Gherkin is simply a tool for expressing Acceptance Criteria in a standardised and hopefully clearer format. However, Acceptance Criteria Gherkin and Test scenario Gherkin are very often confused, and the Gherkin constraint may result in the focus shifting from the conversation about the user’s need, to how to use Gherkin and the user’s need may get lost. Story Acceptance Criteria is also not the place for identifying all of the test scenarios and edge cases, it is about understanding the need of the customer. Another common issue with Gherkin is that the precise nature of the format and terms implies that the Acceptance Criteria are absolute and non-negotiable which is the exact opposite of how they should be considered. If you start to fall in to the trap of seeing the Gherkin as a contract (rather than notes on a conversation) then stop using it until you get in the habit of regular conversation with the Product Owner. By all means practice with Gherkin until you get better, but if you remember that it is about capturing notes from a conversation with the PO and most certainly NOT negotiating the terms of a contract then it is a useful tool. But personally I prefer not to use Gherkin in the initial conversations about Acceptance Criteria simply because it is not a natural way of thinking for many POs so the format constrains thinking and conversation and the frequency in which it is treated as an explicit contract undermines it’s value. Once you have discussed the Acceptance Criteria converting them to Gherkin may be beneficial. However, I prefer to see Gherkin used for Acceptance Testing where those writing the tests are familiar with the syntax and where precision is more important. If you take nothing else from this, please remember that Accceptance Criteria are notes on a conversation, they are not clauses in a contract. Accceptance Criteria are notes on a conversation, they are not clauses in a contract. The last few months have been pretty busy for me and so I have dropped out of the online community for a while. Over the Christmas break I had some free time and so I ventured back in, caught up on some reading and tried to get a feel for the common issues of the day. There were some even suggesting that Agile had run it’s course and we should go back to Waterfall. I found all this very disheartening, on one hand most of these were from people presenting a new idea or new techniques, and it is sad to say but in our culture it seems the only way we seem to know how to sell something is by presenting everything else as bad or with Click Bait statements, we all want to get noticed. But when did ‘Agile’ become so black and white? For me Agile has always been first and foremost about inspecting and improving – finding better ways. But that doesn’t automatically make anything that differs from your approach Bad. And it certainly doesn’t make everything New to be Good. There is not one Right Way. In almost every case the examples/justifications were examples of poor implementations of Scrum/Kanban; incorrect use of Story Points; or a person being ineffective in a role, or in some cases there were teams that had matured to a point where they were no longer getting benefit from a tool or a role. But not one of those examples makes the tool or the role Bad. In each and every case the team should inspect and adapt, and identify improvements. If one team decides that Story Points do not add value for them, that is great, that team has found a better way that they can deliver software. But that doesn’t mean that other teams that find them effective are automatically doing it wrong. If you find you can use a tool effectively and it works for you, then use it. Just keep inspecting and improving. If a tool doesn’t work for you or you find an alternative tool that works that is great too. But try to understand why you are using a tool, what is your desired outcome and is there a better way for you. As an anecdote, I was using a drill to make holes to hang shelves, I carefully marked and measured and then drilled. A friend was with me and he picked up a cross-head screwdriver lined it up on the wall and hit it hard, punching a hole in the plasterboard wall, far quicker than I was doing with the drill. The technique was great for him in that situation, but when faced with wood or brick it was not suitable, and in both cases I still needed to measure and mark. Tools are context AND user specific, what works for one user in one situation does not automatically work for all users in all situations. The same goes for the roles argument, I agree that there are some teams that have the versatility, the right mix of people and the capability to work effectively without one or all of the roles, but that doesn’t mean they are an ideal we should all strive for. Many teams find they are far more effective with those roles, and I would consider that to be just as much an ideal state as the other. If your team is effective and improving then you are demonstrating an Agile mindset. Our goal should be to improve how we deliver software, not strive for someone else’s idea of utopia. Concentrate on improving YOUR team rather than mimicking another team in a different situation. Declaring your way the only way is not demonstrating an Agile Mindset. If you find a way that you feel works well and you want to share it, then explain what problem it solved and why you felt it improved the way your team worked, share that example, but please don’t do so by declaring all other tools WRONG. What is right for you may not be right for everyone. You will just sound like a Snake Oil salesman. Having said all that we don’t need to reinvent the wheel and discover everything ourselves. We can benefit from other people’s experience and advice. Both Scrum and Kanban and any of the tools mentioned can be badly applied, but when implemented with the guidance of someone with a genuine Agile Mindset (rather than a blind by the book interpretation) they can be excellent foundations from which you can evolve, by inspecting and improving, they are not the end point but a safe and structured starting point. The same applies to the named roles, having someone with an Agile Mindset that can help create a foundation of understanding of the roles and when and where they add value can provide a structure and consistency that allows you to grow from a starting point that has proven to be effective for many. But most of all, whether it be Story Points or the need for a QA, inspect regularly, assess what problem you are trying to solve in terms of outcomes, if you feel a change will show improvement then experiment and review. Small changes are generally preferred, it is easier to see the impact and easier to undo if the results are not what was expected. Understand what you are changing and why so that you can properly assess whether the change was beneficial. I have seen teams conclude a Scrum Master/QA/Product Owner is not necessary after all they can cover the role themselves (usually as the result of cost saving measures or because they are presented with a false notion that good teams don’t need help). Sometimes this works, but more often the responsibilities are performed less effectively when distributed among the team and so the net result is a reduction in the effectiveness of the team. There are certain expertise and mindsets that often come with a role that is not fully appreciated until it is gone. This generally and understandably gets neglected when it isn’t the core responsibility of the team members. On the back of my good day last week, I have run in to a somewhat frustrating day today. I have taken it upon myself to challenge the adoption of Agile in the organisation, it has been over 18 months since they adopted Scrum, and there are currently 7 Scrum teams each with a Product owner and there are 3 Scrum Masters and an Agile Coach/Scrum Master. Sounds great! except that not one of those 11 roles have a job title to match. In every case someone is ‘acting …’ – they are seconded from another role. In most organisations that wouldn’t be a problem, you could be pretty flexible, temporarily at least. But in the Civil Service a job description and responsibilities are a big deal, every 6 months there is an appraisal of your work where you are measured on objectives that are constructed based on your job description and designated roles and responsibilities of that job, so unfortunately those in the roles of PO and SM are struggling to meet any of their objectives, not to mention a lack of support and backup as those more senior in the organisation are not familiar enough to formally provide it. So it is being provided informally by those that are enthusiastic about agile. But today I met with two people – one responsible for organising the support network and one from HR, the lady from HR was fantastic, all you could ask for from an HR rep, she seemed genuinely concerned about the people, about ensuring they got the support and had career options and had clarification of their roles and responsibilities. But the support network guy… Now I don’t know if he misunderstood my request, or whether he was irritated by agile or what the situation was, but I felt I was on the back foot, he suggested that ‘some agile advocates’ were so zealous in their agile application that they created a rigid process worse than the ‘traditional’ approach. He seemed to suggest that as agile had no process that formal support was unnecessary, and he then spoke for a while about how the process was not understood, followed or even liked by the organisation, and I must confess at this point I wasn’t sure if he was talking about agile or the professional support network he was responsible for. I felt very deflated, I really thought I would be pushing on an open door, this was someone (me) wanting to utilise their expertise and help make the system work by making it relevant to those doing the job and I was being criticised for not being ‘agile’ I found myself questioning what I was doing. Was I being un-agile? Was I imposing structure and regulation? In the end the HR rep concluded very diplomatically that we were not ready for him yet and we would re-convene again without him – phew. But it still made me stop and think, was I doing the right thing? So I have spent this evening thinking a lot about it, and on reflection I put it down to a belief that agile means no formal process. This is clearly wrong on a number of levels, but in the Civil Service it would be an impossible situation, formal process is so ingrained that you need a very formal process to not have a process. The agile principle is that we favour “Individuals and interactions” over “processes and tools”. But that is not the same as saying we don’t believe in processes. I believe that the people are crucial and that providing structure, support, training and opportunities is very much the agile way, and if I need a process to do that so be it. What is un-agile is to not provide these vital people support because a process gets in the way – which is the current situation. Sometimes being challenged in your thinking really helps clarify understanding, and whilst I left the meeting frustrated I am now very pleased I had that conversation, I feel more certain than ever that it is both right and necessary for me to challenge this situation, and keep the focus on the people. For the most part it was a pretty normal sprint, the team read and refined the stories, asked questions and clarified the requirements. One of the stories referred to a text editor where text would be cut and pasted. There were questions about formatting and content and the PO was sure that maintaining formatting was not required and that the text would be standard text. The team worked through the story and completed all acceptance criteria and everyone was happy, except one of the development team who felt an urge to work closely with the users and get actual examples of the text they used and how they worked. It turned out that one of the source documents was non-standard in the sense that the text editor selected was not able to cope with the source data, when pasted critical characters were lost. We investigated further, and it also turned out that formatting and layout were also very important to the users in some situations, something not fully understood at analysis. The team, the PO and the BA worked together, they all got involved and came up with a solution, and we have written a new story to be included in the next sprint, which means a slight delay in functionality being released to the users but as an observer to this incident I was very proud of how agile the team behaved and how smoothly we adjusted to what was in effect a significant blow to the initial design. That may not sound a big-deal but if you consider that had we not challenged the requirements, had we not had open and effective communication with the Product Owner and the users, had we implemented requirements as written we would have been able to sign-off the work and likely get all the way to release and delivery to the users – weeks if not months later before this problem was identified, by which time the cost to resolve would have been considerable and the disruption to all would have been significant. This is a great example of where agile can be a great tool. A situation where the team made customer collaboration a priority over contract negotiation, and responded to a change rather than adhering to a plan. Sometimes I worry that the benefits of agile get lost, but on days like today I feel like agile really has made a difference. I feel immensely pleased with the team. 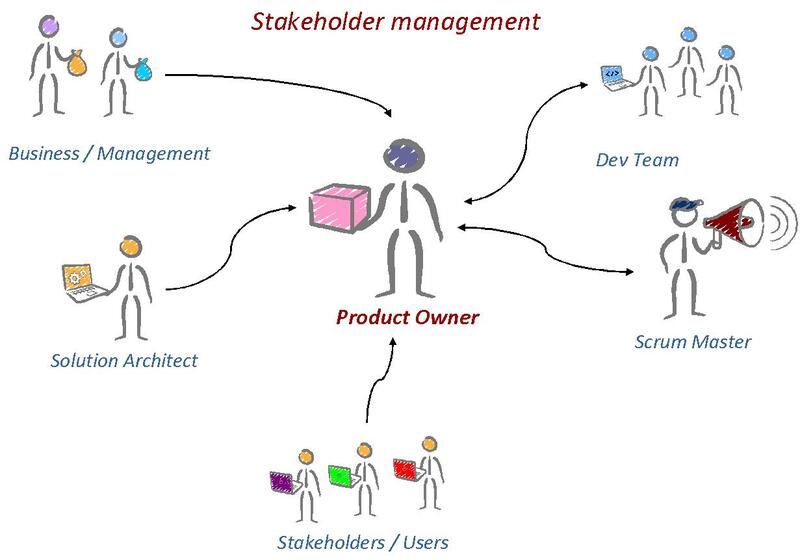 I have been asked to give a summary introduction of the responsibilities of the product owner role to a budding Product Owner. They are due to go on a training course in around six-weeks so this is much more of a high level introduction to the expectations of the role. I began by outlining some of the core expectation of the role, the delivery expectations and the importance of the role in the process. But the crucial and generally time consuming aspect of the role is the co-ordination, interaction and management of the stakeholders. 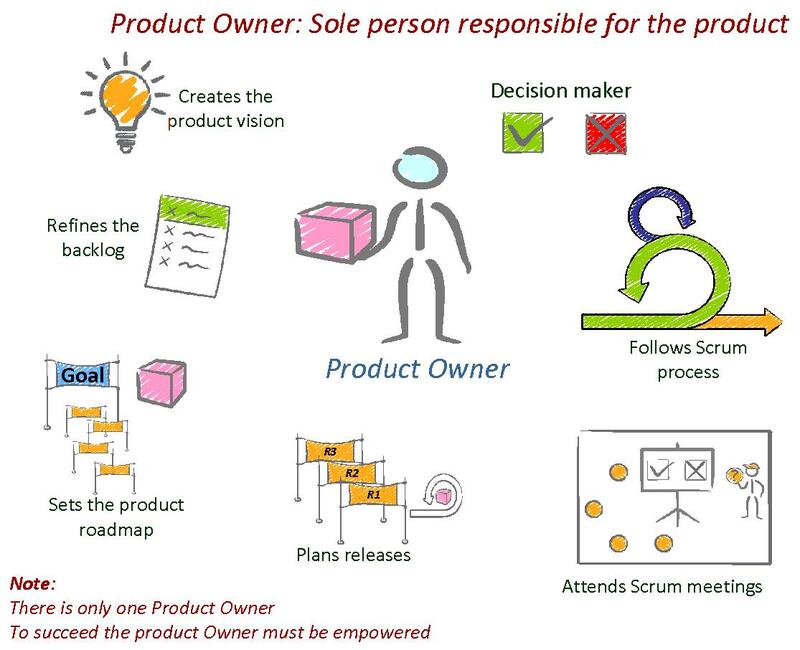 The Product Owner is one of the hardest roles in Scrum, being lobbied by users, the business, the team and others. Giving time to users to properly understand requirements, understanding the goal and vision of the project/product. Identifying priorities. Being available to the team. Making decisions and all the while knowing you are the single wring-able neck, the one person responsible for the success of the project. The Product Owner is involved in writing stories, planning releases, setting the product vision, the sprint goals and constantly ensuring that the backlog is up to date and prioritised. It is not for the feint of heart.